Mind-boggling wedding costs, including wedding dress, hairdresser, reception salon, band, food, drinks, and pre-wedding gifts, are becoming a burden for many Iraqi couples. 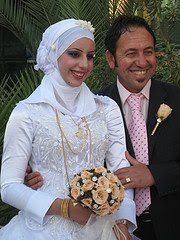 Haydar Barak, 32, was forced to postpone his marriage for the second time because of the huge increase in wedding costs. His fiancé Nur Abdel-Fareed, 25, has been waiting for more than two years to realize her adolescence dreams. "Any woman has a dream to marry in a white dress, have an impeccable party and share this special moment with her relatives," she told IOL. "Sometimes, however, we have to choose between a long happy life and a festivity that might take all the resources of the couple." She told Haydar they we can marry without an expensive wedding ceremony. "But my family is keen to have everything and as a tradition in Iraq, if the man wants to marry a girl, he has to accept all requests from her family," she noted. In Iraq, like in many Arab countries, the groom’s family is responsible for all wedding expenses. This includes paying for food, drinks, wedding dress, band, reception salon, hairdresser, decoration, clothes that are given as gift previous the wedding and a honeymoon trip. "I know how hard it is for my fiancé today," says Nur. According to the United Nations and NGOs, nearly 28 percent of Iraqis aged between 15 and 29 are unemployed. Government sources, however, estimate the unemployment rate at 40 percent. But many other couples have crossed this line and are now trying to pay for the accumulated wedding-related debits. "I got married three months ago but to do that my family had to sell one of our properties to help me buy the gold and pay the costs for the party requested by in-laws," Jamal Younis al-Azza, a 31-year-old Baghdad teacher, told IOL. He notes that in conservative Iraq men are under social pressures to get married by a certain age. "When you are over 30, you are considered very old and have to get a wife as soon as possible. "I made so many offers to her family trying to spend little money with the festivities but they insisted and asked for a large amount of stuff," al-Azza recalled bitterly. "I had to struggle to pay for all that and have debits because of the marriage that will be part of my life for many months to come." Khalid Khafaja al-Din, a 29-year-old government employee, is ready to take the risk to realize his marriage dream. "We awaited three years to get married and now we are spending what we have to make it come true," he told IOL. "Until now I have spent all my savings to finally have my wife and raise a family," he added. "I get about US $500 salary per month but hope that will be enough for both of us, though I already have US $4500 debits because of the weeding." Reads about Marriage Extravagance in Islam here.